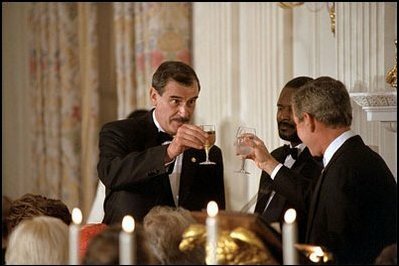 Ignoring CIA advice to keep immigrants out, President Bush toasts Mexican national a mere six days before September 11 attacks. Politico reporter Chris Whipple writes that George W. Bush refused to implement wartime restrictions in July of 2001, mere months before the September 11 attacks on the United States by foreign Al Qaeda terrorist group. “If President Bush had followed the advice of CIA counterterrorism chief Cofer Black on July 10 and took the United States to war half a year after taking office, we might have prevented the 9/11 attacks,” writes Whipple. According to the Politico reporter, Richard Blee, head of the CIA’s Al Qaeda unit, told the Bush administration exactly how Al Qaeda’s attack would occur. According to Politico, this was exactly the sort of specific intel necessary to prevent the attacks. Politico adds that the Bush administration should also have addressed illegal immigration to keep Al Qaeda from “coming here”. The Politico reporter acknowledges that stopping illegal immigration into the United States would have been difficult, but the intel required it. According to Politico, going to wartime footing would have allowed the Bush administration to commandeer private industry to build the border wall that would have prevented the 9/11 attacks. Politico notes that the deportations would, by necessity, include immigrants here legally, as the 9/11 attackers themselves entered, many during the previous administration, on student, tourist, and business visas. Democratic house organ retracts most claims, sticks by allegation against Ben Carson “being black without a license”. Imagine a graph with two lines charted against the years: the resources needed to cause mass destruction, and the resources available to those who want to cause mass destruction. Those lines are dangerously close today. If we wish to maintain prohibition, we have to understand that we are funding and nurturing terrorism. More What If Bush Done It? The others of the extreme left and right have different qualities. The others of the left—Sarah Palin, the Koch brothers, Brendan Eich, for example—voice opinions, but are otherwise fairly unobtrusive politically. They are people who would not have been an issue if they weren’t personally made an issue by the vanguard of the left. Media debate: Bush or Romney at fault for economy? As the United States economy stalls again, newspaper and television reporters debate the important question: who is at fault? Is the federal government involved in a conspiracy to further the gulf oil spill? If I lost my job, I’d be paying less in taxes, too. Politico: Bush should have started war July 2001 last modified November 16th, 2015. Copyright © 2019 Leni Films.